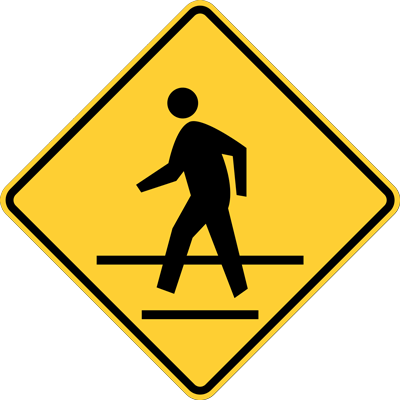 The Town of Redington Shores has pedestrian crosswalks for your safety and convenience. The crosswalks were specifically located to provide a safety island when crossing Gulf Boulevard. There are NO traffic lights at the intersection of the side streets and Gulf Boulevard, which makes those areas very dangerous to cross. UTILIZE THE CROSSWALKS! As you enter the crosswalk, press the button to activate the high intensity flashing lights, stop and look for vehicles. Florida law requires vehicles to stop for pedestrians in a crosswalk. Make sure the vehicles are stopping for you to cross. Make eye contact with the driver if possible. Watch to make sure vehicles in each traffic lane are stopping. Never assume the vehicles are going to stop. After reaching the median, or safety island, use the same procedure as above to cross the remaining two lanes. Make sure vehicles see you and are stopping in each lane. Thank the motorist for stopping with a friendly wave. You, the pedestrian, can make crossing Gulf Boulevard safe by observing these guidelines. The Town of Redington Shores will continue to work with the Florida Department of Transportation to identify and establish other safety measures for crossing Gulf Boulevard. Thank you and cross safely.